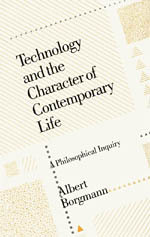 In this chapter, Borgmann is interested in answering the question of how people actually relate to technology in our society, regardless of the role technology plays in the political theories that undergird society. Looking at empirical sociological data is difficult, because so many interpretations can be given to, e.g., survey data. So he acknowledges that we have to come to the data with a bit of a guiding premise, which the previous chapters have provided. The first helpful question we can ask in regard to the chapter’s theme is: how do people take responsibility for technology? Do they do so at all? Do they engage in active choice? This line of questioning is interesting because it gets at the heart of the character of technology, highlighting the substantive and instrumental positions that would give different answers about what that character is. On a substantive view, people have essentially no responsibility—technology as a thing in its own right has overpowered us and we are now unable to choose against it. This is a kind of determinism. The instrumental view would argue the opposite: that we remain free agents and are always in fact choosing for or against technology; the fact that we almost always choose for it is therefore purely our responsibility. Borgmann isn’t a fan of either of these positions, and points out that we’re not likely to come to a philosophical agreement on free will vs determinism that could help adjudicate between them. Answering the question empirically is fraught with conceptual problems, too. Technology isn’t presented to us as a choice, but rather a basis for other choices, in which a vote for the technological paradigm is already implied (in the same way that a good salesperson will ask a client which of a variety of services will meet the clients needs best, not whether the client needs any services at all). A choice against technology is therefore kind of odd—it would seem paternalistic and totalitarian, a vote for remaining in squalor when so much opportunity is at hand. Thus technology disappears at the very moment of choice, and becomes the ground for choice rather than its object. But, we can ask a proxy question: to what amount do people engage with focal things and practices, and to what amount do they disengage with them in favor of technological substitutes? This would give us a good idea of how people are actually choosing in regard to technology even when it remains in the background. From this perspective, we gain a lot of information when we observe, say, a family choosing to eat out rather than prepare a meal at home. Or when we observe young professionals moving from city to city for the sake of career advancement rather than choosing a life of being rooted in one place. Or when we observe children being gifted with limitless amounts of music on their mobile devices instead of being given a musical instrument. Borgmann is clear that these choices are not necessarily conscious. The whole idea of the paradigm of technology is that it is the fundamental operating pattern of our society; choosing according to this pattern is therefore the normal, the obvious thing to do. Technology is not an overtly oppressive overlord that visibly threatens our freedom, rather freedom is its promise. All this to say, it doesn’t require conscious choice to move in the direction of lesser engagement with focal things and practices, but these are still choices, however deeply patterned. Borgmann calls this being “implicated” in technology. We already exist within its paradigm, and so without conscious choice we will continue to choose according to the pattern of technology. But what moves us to take the first step in this direction, however “normal” it is? Relief (at the thought of not having to prepare another meal when one is already tired). Hope (of the procurement of nicer things made more available through technology). Impatience with the obstinate nature and slow pace of non-devices. The desire to see children given opportunities to grow as quickly and painlessly as possible. But there is often a nagging feeling that comes with trading in focal things and practices because of these motivations. When that is (at least initially) present, Borgmann sees us not just as “implicated” in the world of technology, but “complicit” in it. The published results highlighted that there was “considerable ambivalence” towards technology in responses, and that people exhibited contradictory understandings of what technology actually is. That being said, it was clear that in general technology was viewed favorably. Further exploration of motivations unveiled that, despite ambivalence in attitude, people look to technology to provide higher and higher standards of living and leisure. That is, while respondents were on balance convinced that technology increased their general happiness (which has been shown in other studies not to be the case), they were unsure about the positive effect of technology on overall standards of living (which is remarkable given that it be clearly shown that technology has indeed advanced global health and living standards). In other words, what people wanted from technology was not just a certain standard of living, but a constantly increasing standard of living. These results, Borgmann points out, mesh very well with the definition of “complicity” he gave earlier. While there is some sense that we are losing something in turning to technological solutions, we continue to look to them for increased quality of life. While on one hand we are simply choosing technological modes because they are the default, on the other hand we know in some sense what we are doing and why; in that sense we are free, and therefore “complicit” or responsible. The question Borgmann does not yet ask is whether we acknowledge that responsibility and what our attitudes are towards it. Do we affirm and own these choices, or do we sweep them under the rug? I can say, quite simply, this is a great and important chapter. The notion of patterns and the balance between how patterns guide our lives is very important. There are some great considerations in this chapter about scope of action, awareness, disappearance, and complicity. Great stuff. “When the social paradigm is deeply entrenched, it not only informs most human practices but it also patterns the organizations, institutions, the daily implements, the structure of civilization, and even the ways in which nature and culture are arranged and accessible” (104). I can’t help but think about OSS and the background pattern that is being formed in these engagements. Are we losing the thing and engagement to become commodities and diversions (?) respectively as OSS becomes a domesticated and routinized way of doing work. A sense of complicity based on the everydayness that can be OSS — the regularized way of doing things.